At a time when the authorities continue to insist that poker is a game of chance, Ireland's wise and experienced Liam "The Gentleman" Flood proves there's no substitute for skill in the PartyPoker.com European Open! 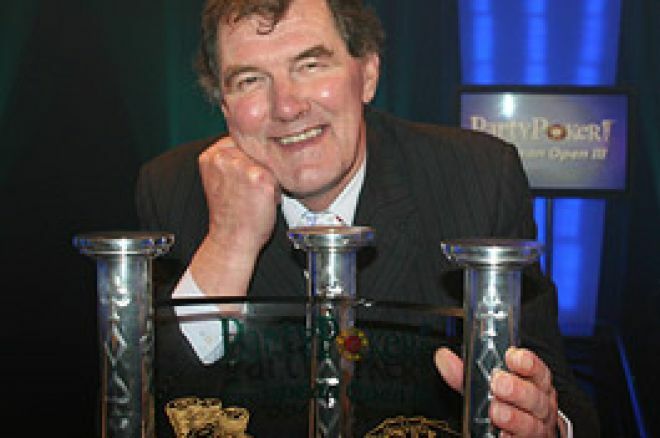 There are few players in European poker better known than Irishman Liam Flood, a bookmaker in a previous life, and a wise head who can these days be found directing big poker tournaments when he is not playing in them. For those with satellite or cable TV, he appears countless times in re-runs of Late Night Poker and is usually around in the heats and beyond in such events as the Ladbrokespoker.com Poker Million and the William Hill Poker Grand Prix. On this occasion, he was found in the heats and beyond of the PartyPoker.com European Open held at the TV studios in Maidstone, Kent. Not only that, but he went on to take the title and the $125,000 first prize! Although held a few weeks ago, this event can be seen very soon on Channel 5 with commentary from "the voice of poker" Jesse May, with a shot of glamour thrown in by co-commentator for the event, "Maxim babe" Roxanne Siordia. Her comments on the heat involving Celebrity Big Brother housemate – and rival glamour model - Danielle Lloyd should be worth listening to! Going into the final of the European Open, Liam Flood admitted to being concerned about the challenge of John Magill from Northern Ireland – a winner of over $1,000,000 at the 2006 World Series of Poker – who came to the final table with an armful of chips. "I was worried about the chip leader John Magill, but I did feel I was in an excellent position. If I hadn't have won the final I would have been pretty disappointed as I had been playing so well." To reach the final, the players had to win their individual heats of six and then make sure they were one of the remaining three players in their respective semi-finals, ideally with a good accumulation of chips with which to attack the final itself. This was easier said than done given that the field included a host of top quality names from the world of poker. Amongst these were last year's reigning champion Ian Frazer (recently heard commentating on the Poker Million final with Jesse May), the aforesaid John Magill plus the leading UK money winner in 2006 and holder of both an EPT and WPT title, Roland de Wolfe. However, in the final itself, Flood found himself up against another dangerous opponent apart from Magill. Pippa Flanders was there and had some "previous" in Party Poker events having won $200,000 and the title of PartyPoker.com World Open back in September. It was not to matter as none of them could hold back the incoming Flood! "My winnings from the European Open will be spent on a few new ties!". "Pippa is a very good player and very hard to read. We met twice previously and had both taken a game each. Luckily for me I have made it 2-1 with this victory." Ed note: You can qualify for all these big events when you download Party Poker and we will throw in a free $50 cash straight away!